From time to time I come across products or companies that support the use of the arts in the classroom. These are a few of the companies that I recently came across at conferences and would like to give them a "shout out". If you don't know about them take a look at their products. I highly recommend them. 1. Themes and Variations from Red Deer Alberta. 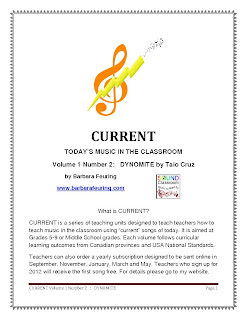 An excellent source for music resources for the classroom teacher. 2. Sharon’s Felts and Finger Fun from Rossland, BC – Handmade felt teaching aids to support songs and storytelling. View Sharon's online portfolio. For more information email Sharon. 3. Barefoot Books – Celebrating Art and Story. Great source for children’s books that are also songs. Email Veronica Riches for more information. "Flash Mob" dancing continues to be popular around the world. 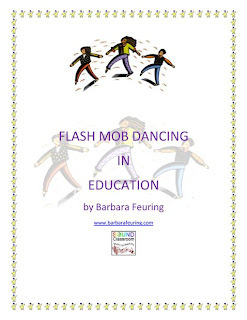 I have now released a supplement to my successful and popular “Flash Mob Dancing in Education” which introduced you to the basics of Flash Mob dancing. This latest handbook will teach you the specific Flash Mob choreography moves for “Dynamite” by Taio Cruz. I will guide you through the dance moves so that you can have a successful Flash Mob Dance at your school this year. 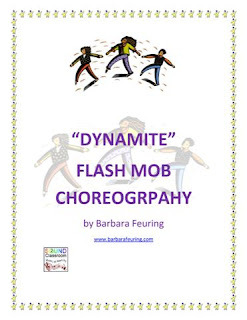 The 11-page guide "Flash Mob Choreography - Dynamite" is available for purchase from TeachersPayTeachers.com. If you are located in Greater Vancouver, BC, I am also available for a negotiable fee to organize or assist with your school event. 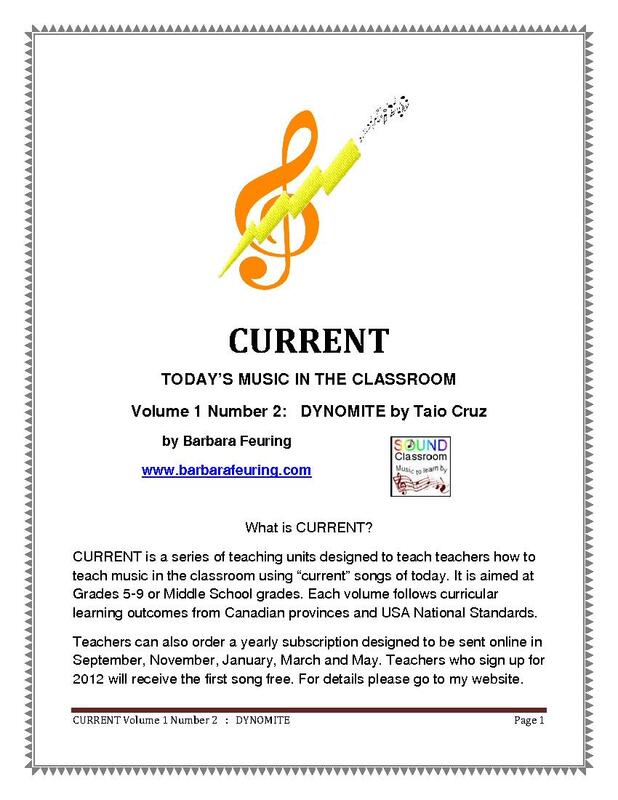 CURRENT is a series of teaching units designed to teach teachers how to teach music in the classroom using “current” songs of today. It is aimed at Grades 5-9 or Middle School grades. Each volume follows curricular learning outcomes for Canadian provinces and USA National Standards. 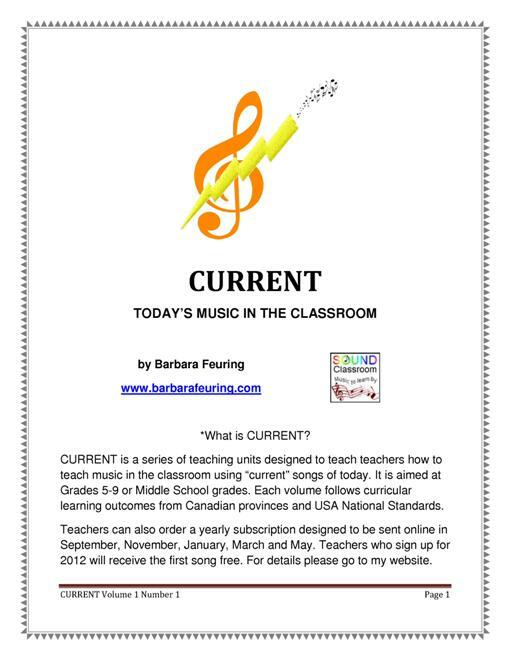 CURRENT focuses on student creativity through expression of feelings and ideas. 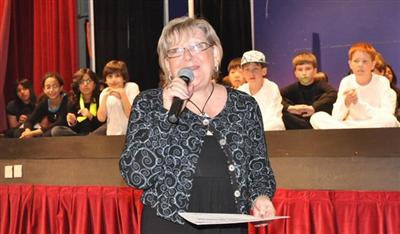 Students are encouraged to evaluate their own achievement and refine their performances and presentations with the goal of improving their ability. Group support is encouraged. CURRENT chooses songs from English popular music around the world. I have taught students from over 40 countries. The songs come from the experience of middle school students. The focus is not so much factual as it is creative and an extension of valuing the arts from all cultures. Students are encouraged not to make quick judgements but develop personal choice based on knowledge, experience and practice. Teachers should learn the vocabulary specific to the arts (music, art, drama, and dance) and incorporate this vocabulary into lessons. There is a vocabulary sheet with each volume. CURRENT chooses songs that invite emotional and intellectual responses. Students are encouraged to analyse the song in terms of lyrics and musical concepts through the student analysis and evaluation forms in each volume. There are no right or wrong answers so students are more comfortable taking risks. A safe environment is encouraged with support of classmates and teachers. The songs are inspiring and have a positive message. Lyrics are screened for language. The lyrics encourage discussion and imagination. There are opportunities for group and individual performances. Each activity has a specific focus on a musical concept through listening or singing. Guidance is provided in the teacher notes at the end of the unit. Students are encouraged to explore and experiment using basic skills which are taught in class. Guidance is provided in the unit plans. Students are encouraged to produce work in stages of difficulty. Students are encouraged to constantly revise and refine through individual and group efforts. With each song, students are presenting, performing and sharing through the use of contemporary music. There are opportunities to reflect and share ideas through student worksheets which provide the framework. Volume 1, Number 2, uses DYNAMITE by Taio Cruz as the focus for this unit. Click below or click the link for a full online preview [requires Flash], or purchase online in PDF format at TeachersPayTeachers. 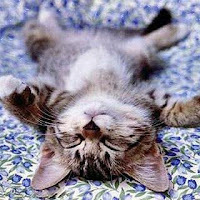 Relaxation can be taught in the classroom but students need to know they can use this technique any time they are stressed. Use a calm soft voice, pronouncing the words slowly but not unnaturally. Listen to examples on the Internet and see if you can tell which voices make you relax and which ones are irritating. Start by teaching the difference between inhale (breath in through nose) and exhale (breath out through mouth). Music is an incredible aid to relaxation. New research shows that slow music produces a relaxing effect and causes a decline in heart rate. Find a place where you can have space to lie down. Lie down on your back, feet slightly apart, arms by your side. When you are comfortable, close your eyes. Keeping your upper arms on the floor, rest your palms lightly on your stomach. Turn your attention to your breath. Breathe into your hands with easy slow breaths, feeling your stomach rise and fall. Consciously slow your breath down, making it smooth and deep. Continue focusing on your breath for few inhales and exhales. Now bring your attention to the top of your head. In your mind, feel your scalp. Imagine it turning into Jello, releasing any tightness. Now bring attention to your face. Begin with your forehead. Feel it turn into Jello, nice and loose. Now feel your eyes and your eyelids. Imagine the feeling as they become Jello. Continue with your chest and your jaw. Now, turn your attention to your neck. Gently turn your head from side to side as the muscles release tightness. Breathe slowly and deeply and concentrate on releasing tension from your neck. Let your awareness shift to your shoulders. Ask your muscles to release tension in your shoulders and start to sink into the floor like a wet noodle. Feel the tension releasing. Be gentle with yourself. Continue breathing slowly and deeply. Next, move your attention down your arms and to your fingertips. With a deep exhale, release any tension that is stored in that area. You might feel like giving them a little wiggle. Now, bring your attention to your chest. Breathe deeply as you sink deeper into the floor. Feel the tension leaving your body. Next, turn your attention to your hips. Take few deep breaths and with each exhale, ask your body to release tension from your hips. Continue with this through your thighs, calves, ankles, feet, and toes. Feel the stress leaving your body, replacing it with a sense of peace and calm. When you have completed the cycle of releasing tension from all the parts of your body, continue breathing slowly. Be gentle with yourself. Feel the peace and relaxation flowing freely through your body. When you are ready, bring yourself back to the present. Wiggle your toes, your fingers, open your eyes, and stretch gently. Enjoy the sense of quietness and relaxation in your body. Return to this muscle relaxation technique often. With each practice, your relaxation will deepen. So ... My school had health week where we focused on something different every day that week. I was looking at the focus topics and came upon "Pyjama Day". "Great!" I thought. What on earth can I do with my music classes on "Pyjama Day"? I started looking around on the internet and found lots of relaxation music and guided imagery stories so I decided to do that. I told the students to bring their favorite cuddly toy, blanket and pillow to music on this day. 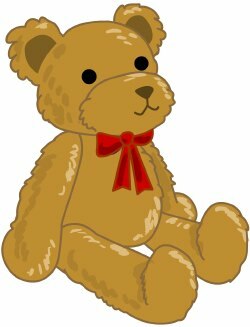 It was so great to see a long line of students, class after class, toting their teddy bears, pillows and blankets. I had a carpeted room that I used for performances next to my classroom and had decorated it with a number of those battery fiberoptic lamps that change color (from the Dollar Store). When the students entered, lovely music filled the air as they found a place to lie down and get comfortable. I had a few stories prepared, and one on tape (Quiet Moments by Greg and Steve). I left the music on very soft and helped them do a simple relaxation starting from their toes up to their nose, taking deep breaths. Slowly the room became very still as the students felt themselves "become wet noodles" and sink into their blankets. After that we took an imaginary trip on a cloud with Greg and Steve. Greg's voice is so velvety and soothing. To finish the class I put on another piece of soft music and started the story to a magic garden. Then I let them finish the story on their own using their own imagination. From grades 1 through 5, the students said "I want to stay!" When the class came to an end ... and from then on, students asked for our little piece of "magic" to finish every class. For those looking for someone to present a music related workshop, you have come to the right place. 1. THE MOZART EFFECT or the use of music to enhance learning in the classroom. Participants will receive a beginners course in accelerated learning with a focus on the use of music in the classroom. For NON-music teachers. 2. ACCELERATED LEARNING TECHNIQUES based on the most recent brain research and learning. This workshop includes brain compatible note taking, exercises to reduce stress in the classroom, and brain friendly tips with regards to color and furniture arrangement. 3. BRAIN BODY CONNECTION - simple techniques that will reduce stress in the classroom and rebalance left/right brain hemispheres. 4. 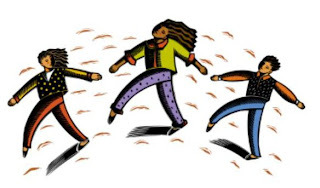 FLASH MOB DANCING IN EDUCATION - Learn how to do an educational flash mob dance and how to properly choreograph a routine. Detailed handout. 5. COMBINATION WORKSHOP - You tell me what you need and I will custom design a workshop for you. I have resurrected a number of my books and converted them to PDF format and converted CDs and audio tapes to digital MP3 format. These are all now available on TeachersPayTeachers.com. For teachers looking for classroom teaching units and resources, this is a great site. You will find some of my music there too. For teachers who have materials that they would like to share or sell, this is also the place to go. Remember that membership at TpT is free -- even to start selling. There is a phenomenon around the world called the “flash mob”. The first one I saw was a few years ago done in a Belgian train station to a remix of Julie Andrew’s Do-Re-Mi. The next big one to catch my attention was the Black Eyed Peas version of Got a Feelin’ for Oprah’s anniversary in Chicago. 20,000 people turned out for that one. In May, 2010 Eurovision had a song contest for the world’s largest flash mob dance held simultaneously in 10 cities across Europe. Madcon won with the song GLOW and the choreography was put up on YouTube to learn. I decided to make this my final unit for the year and each class chose a song to choreograph and I taught the entire elementary school of 650 students the Eurovision version of GLOW. Sections 3 and 4 were a bit too challenging for little ones so I simplified it using a couple of moves from Oprah and 2 line dance steps. If you do it, add your own flavour or get some talented students to work with sections 3 and 4. Choose a song with an appropriate message. Enlist the help of talented students or older siblings/teachers with dance experience. Do all actions to a count of 8. If you do something on one side, do it again on the other side. Keep the actions BIG, and high in the air. Start with a few students and have more and more join in. It’s easy to remember repeated sections than always adding new ones. Say aloud what action you are doing. Keep it simple and HAVE FUN! 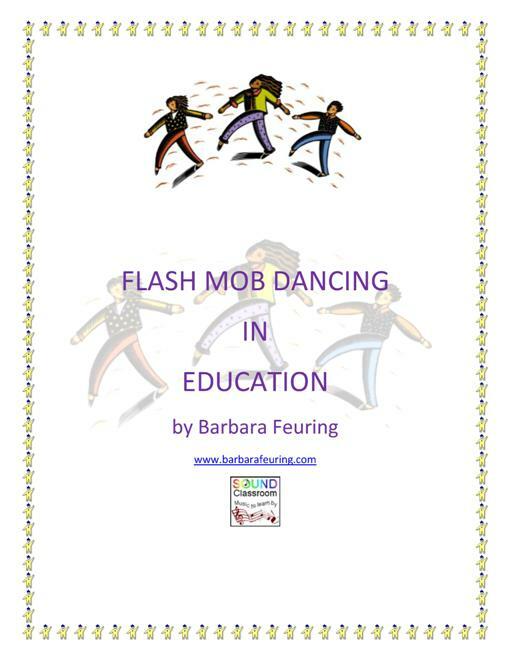 If you would like to organize a Flash Mob dance in your school, you might be interested in purchasing my recent 12-page guide titled "Flash Mob Dancing in Education" from TeachersPayTeachers.com. 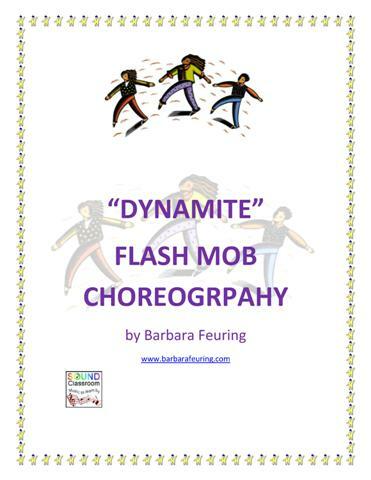 My guide will provide you with direct links to popular Flash Mob songs as well as step-by-step choreography moves. If you are located in Greater Vancouver, BC, I am also available for a negotiable fee to organize or assist with your school event. .
A Mind Map is a very powerful graphic method which allows you to take notes while accessing the "whole" brain ... it uses the full range of cortical skills: language, pictures, connections, relationships -- awareness in a single unique manner. The "Mind Map" originated and was trademarked in 1970 by Tony Buzan from England. This highly effective notetaking technique has since spread worldwide and is used by millions of people in all occupations. This technique is one of many accelerated learning methods, to illustrate "whole brain learning" and releases the tremendous potential of the "brain". Mind Maps work the way the brain works, by associating randomly … not in nice neat lines. Radiant NOT linear! Any idea has thousands of links in your brain … Mind Maps allow these associations to be recorded and reinforced. The brain remembers key words and phrases, not sentences … just try remembering a number of sentences “exactly” from memory! Because one uses key words and phrases, a lot more information will fit on the page. Mind Maps are visual … the brain remembers pictures better than words. Starting in the centre gives each detail equal importance rather than traditional numbering, not necessarily in order of importance. 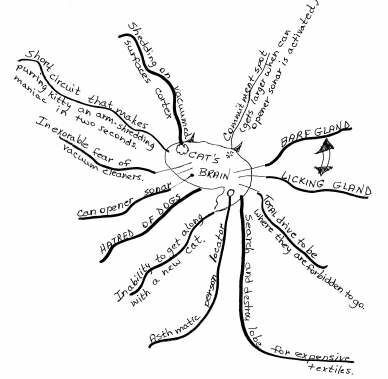 The organization of a Mind Map is similar to the way your brain organizes ideas. Because of its visual structure, Mind Maps are easy to review … like taking a mental picture. 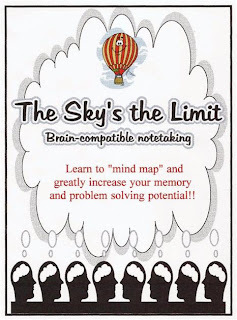 My 15-page PDF book The Sky's the Limit will teach you the basics of mind mapping. Included in this package is also a companion 17-page PDF book Believe You Can Draw by Dave Feuring. 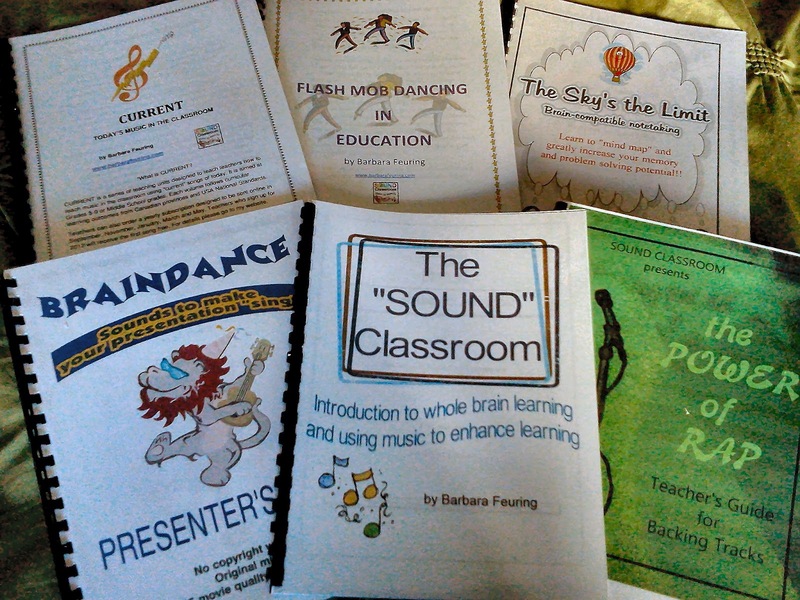 These can be purchased and downloaded online as one package from TeachersPayTeachers. A free preview download is also available. My plan for CURRENT is a series of teaching units designed to teach teachers how to teach music in the classroom using “current” songs of today. It is aimed at Grades 5-9 or Middle School grades. Each volume follows curricular learning outcomes for Canadian provinces and USA National Standards. Volume 1, Number 1, uses FIREFLIES by Owl City and Adam Young as the focus for this unit.